A Washington Court House woman who formerly lived on East Temple Street was sentenced recently to a year-and-a-half in the Ohio Reformatory for Women. Kristina M. Craig was sentenced in the Fayette County Court of Common Pleas Feb. 9 after pleading guilty to burglary, a third-degree felony. The 32-year-old faced three felony charges after she burglarized a home and stole a bottle of medication May 26, 2016. Reports filed with the Washington C.H. Police Department described the incident. A Washington C.H. man reported to police May 26 that Craig allegedly showed up at his house and tried to sell him “some kind of pills,” but he told her that he was not interested and she left. The man said he then left and went camping and fishing, but upon return discovered his home had been broken into. One pane of glass in the back door had been broken, the screen was cut and the frame of the door was altered. The police documented blood and fingerprints from the door and the glass. Craig had a prior case in the Washington C.H. Municipal Court when she was charged with theft, a first-degree misdemeanor, in 2014. For that case she was sentenced to two years of probation and ordered to complete the Second Chance Program in lieu of serving time in jail. The municipal court records show Craig violated probation, which generated additional proceedings against her: she served a handful of days in the local jail, was ordered to complete 420 hours of community service, was sentenced to additional treatment and to pay $940 for the treatment, was placed under house arrest with electronic surveillance, and Nov. 8, 2016, was ordered to have her probation extended for one additional year. 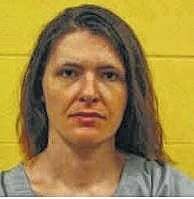 Her expected release date from prison is July 27, 2018 according to the Ohio Department of Rehabilitation and Correction.